Ian Ellis' photo of the white swallow. A super-rare white swallow has been spotted amid a flock of about 5,000 regular-coloured birds in the Boston area. Standard reader Ian Ellis took the photo yesterday which shows the bird next to a sand martin and a regular swallow. Incredibly, he managed to take the snap from 150 yards away using just a humble compact camera aimed through a telescope. “It was a truly amazing sight,” said Ian. 67, who spotted the bird at the the point where the River Haven joins the River Welland at the estuary. The bird-spotter says he has been visiting nearby RSPB Frampton Marsh every day for a number of years and seen a variety of unusual birds - but had never seen a white swallow before. 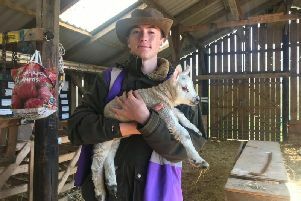 Standard readers may remember Mr Ellis had another unusual animal encounter back in July when he helped in the rescue of a seal surrounded by a herd of cows at Frampton Marsh. Thanks to Mr Ellis’ efforts and that of Natureland Seal Sactuary, in Skegness, the seal will soon be released back into the wild.